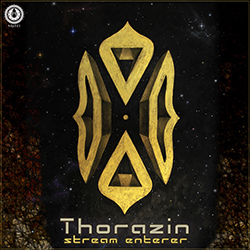 Thorazin (Alex Urias) is warmly welcomed to Triple Drop Productions with the release of the exceptional Stream Enterer. Built upon a circuitous riot of infection downtempo and glitch-hop grooves, this collection of songs furthers his journey into the melting pot of sound. Psychedelic synthesis and sample experimentation wind themselves effortlessly to the rhythms, forming an ingenious fusion of some of our most trusted IDM genres. Thorazin practices and conducts delicate measures to record instrumentalists in his studio, constantly collaborating and performing with them, aiming towards achieving the primo acoustic blend in sound. Artwork by Marisol Gallego. Mastered by Saxon Higgs @ UProoted Mastering. MP3 Download | FLAC Download | WAV Download · Download count: 6,940. This is a really GooD one.. Thank you! Amazing! Crazy great work AU!!! Yeeeees! Such great album! Well done! have had 2 byculla on repeat!